This section of my website is for all of the information that does not readily sit in the chronological order of the rest of the site. For the historian and enthusiast I have listed below types and serials of just some of the aircraft that were based at Haddenham Airfield. I have also listed a number of the books I have used for background and reference details. Much more work has gone into these than this small history so all are worth having a look at. On the subject of research, for anyone interested in history, the National Archives at Kew are definitely worth a visit. Each time I have been I have come away with a wealth of new material. Most of the work in this website is my own research. Where it is not I have made a strong effort to point that out. If you believe that any of the material within this site is yours or know that it is somebody else's copyright please let me know via the e-mail address below. Any such material will be removed or amended. Halfway through my course I switched to the T-31 (‘Pathfinder 1’) and finally went solo after 37 launches on 25th September 1977 at the age of 16. I flew from Haddenham until 1999 usually in the role of air-experience instructor in Slingsby T.21's but also solo in various gliders. It is without doubt that the Upward Bound Trust gave me many opportunities I otherwise would never have been able to get. I met many people and flew many different types of aircraft, both powered and non-powered that I would never have got near if it wasn’t for the Trust and its members. I would like to thank all those involved over the years for their help and generosity. If you would like to contact me about any of this history please feel free to e-mail me. Listed here are some of those that have helped in the production of this history. D.F. ANCLIFFE, SYD BARNETT, RICHARD BODDINGTON, LES BOOT, KEN BOWLER, STEVE BOND, RICHARD BUTTERS, JACK CASLAW, JOE CHAMBERLAIN, THOMAS CHOLMONDELEY TAPPER, STEPHEN COTRELL, JOHN DAVIS, PETER DAVIS, J.B. DORRINGTON, GEORGE EWER, JUNE GUMMER, JOHN HARROWELL, KEN HARRUP, KEITH HAYWARD, PHIL HEATH, TIM HERVEY, MIKE HOLLAND, ROGER JACKSON, VERNON JENNINGS, HARRY JOHNSON, DICKIE KEY, GEORGE LEWIS, RONALD LUDGATER, YVONNE MACDONALD, BERNARD MARTIN, BOB MASON, MIKE MAUFE, DEREK PEARMUND, CHRIS PEREIRA, RICHARD POAD, ARTHUR PROCTER, ALAN ROSE, DAVE SCOTT, STEWART SLOAN, TERRY STILES, ROGER SYRATT, DAVID UNDERWOOD, PETER UNDERWOOD, ALAN WATKINS. This history was started in 1991. Latest update August 2010. The Israeli Air Force Story Rubinstein and Goldman Book Club Assoc. Bristol Beaufighter G-AJMB (RD135, IDF serial D.170), G-AJMC (RD448, D.171), G-AJMD (RD427, D.172), G-AJME (NT929?, crashed Thame), G-AJMF (NV306, confiscated before arrival at Thame), G-AJMG (LZ185, D.173). The Kirby Kites were not allocated military serials unless they were transferred to the ATC. All of the gliders belonging to the Glider Training Squadron had individual letter codes, but there is no tie up with their BGA numbers. Some of the Kites were lettered: A, B, C, D, E, G, H, J. The Slingsby Falcon III was lettered M.
Percival Gull, G-ACGP, is said to have been stored at the airfield for the duration of the war although this has not been confirmed. The A.T.A. used numerous types at Haddenham including the ubiquitous Harvard, as well as Barracuda, Spitfire, Hurricane, Hind, Argus and Master. 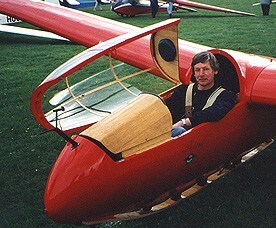 See examples from Glider Training School and ATA pilots logbooks above. The file opens in your 'Temporary Places' folder and shows several layers on top of the present village of Haddenham. You can turn each layer on and off. Also try experimenting with the opacity slider to reveal what a location was like in years gone by. This is a list of some of the known accidents to aircraft on the airfield during World War 2. As can be seen, training at Haddenham was never easy.